Sunday brunch. It's the highlight of the week in our home, when Jeff and I listen to A Prairie Home Companion radio show as we enjoy a long and lazy meal together. Because this time is so special to us, I always strive to come up with new and unique vegan brunch meals that we can enjoy. I usually start with an idea of what flavor(s) I'm hungry for, and the meal sort of builds from there. 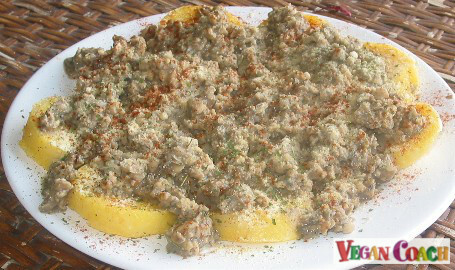 And that's how Vegan Sausage Gravy-Smothered Polenta came into existence. My body was craving something rich-tasting, but since I'm smack-dab in the middle of preparations for our yearly trip to Burning Man, time is at a minimum. Scouring my cupboards/fridge, I found a tube of polenta, some tempeh, and creamy mushroom soup leftover from my recent Vegan Chicken Divan recipe. My wheels a'spinning, our brunch came together in no time. Let's talk about a couple of these ingredients. Polenta is made from cornmeal. And tempeh is made from soybeans. And BOTH of these foods (corn and soy) really need to be purchased organic because otherwise you will almost certainly be eating genetically modified organisms aka Frankenfoods! So always, always choose organic when it comes to any corn or soy product. And if you can't find it organic, at the very least ensure the label says non-GMO. Now, you might have heard of tofu, but not everyone is familiar with tempeh. While they're both made from soybeans, tofu is a more processed food than tempeh. 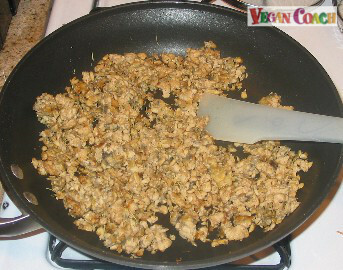 Tempeh is made from the whole intact soybean and then fermented to make it more digestible. Eating soy in a fermented form is always going to be the very best way to enjoy this healthy food. Tempeh tastes like a cross between mushrooms and nuts. You will find it refrigerated in most natural food stores. 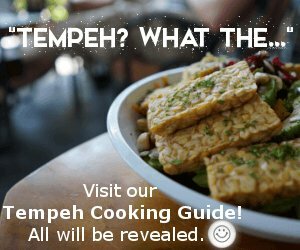 You can learn more about tempeh here. While there are some preparatory steps, I think you'll find the recipe as a whole to be quite simple. And very delicious. 1. Boil veggie broth in a small saucepan over medium high heat. Place tempeh halves in broth, turn heat to low, and simmer (covered) for 15 minutes. Remove tempeh and allow to cool briefly. Crumble tempeh. 2. While tempeh cooks, swipe a large frying pan with oil (or use a little veggie broth). Add polenta slices and cook over medium-high heat until warmed throughout, flipping once. Remove to a serving platter. 3. Wipe frying pan clean with a damp cloth. Swipe olive oil over the pan again (or use a non-stick pan) and heat over medium-high heat. Add crumbled tempeh, sage, thyme, rosemary and Tamari. Brown tempeh, stirring occasionally. 4. 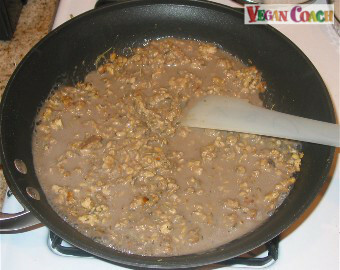 Add mushroom soup to tempeh and stir. Season to taste with salt and pepper. Bring to a simmer, stirring occasionally. 5. Pour tempeh mix over polenta rounds. 6. 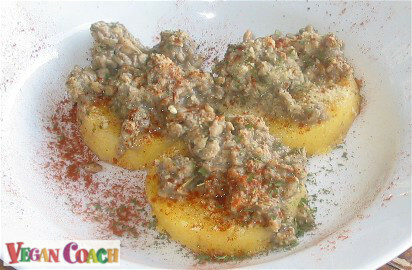 Place Sausage Gravy-Smothered Polenta onto serving plates (3 per person). Sprinkle generously with paprika, parsley, and the vegan parmesan cheese (all optional). Serve with a steaming cup of organic java. Now listen, I don't know if you think this looks very appetizing, but I promise you looks ain't everything. 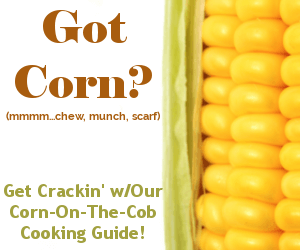 Try it -- you'll love it!